← Luau Pig – or The Most Labor Intensive Way To Roast A Hog. I bake once or twice a week. 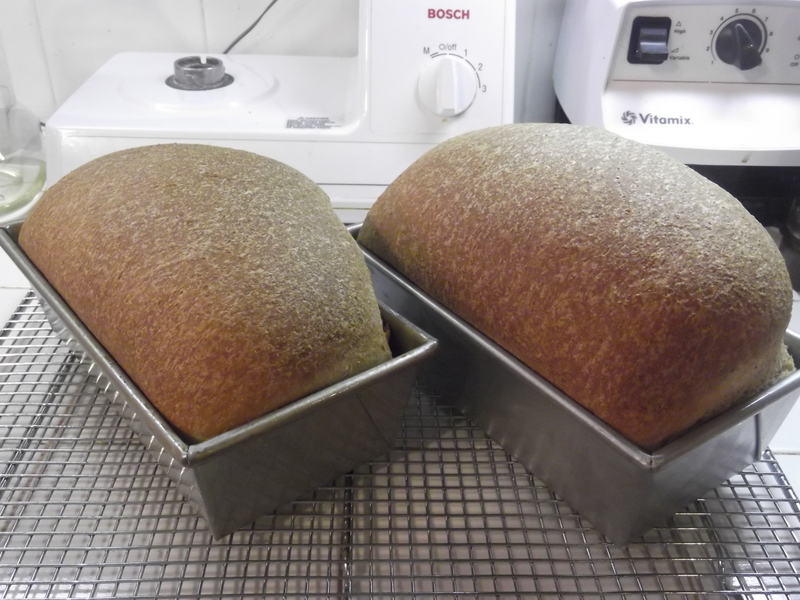 Generally, I make whole wheat bread in sandwich loaves. My recipe is inspired by the Bosch bread recipe and techniques from Peter Reinhart’s “Artisan Bread Everyday”. 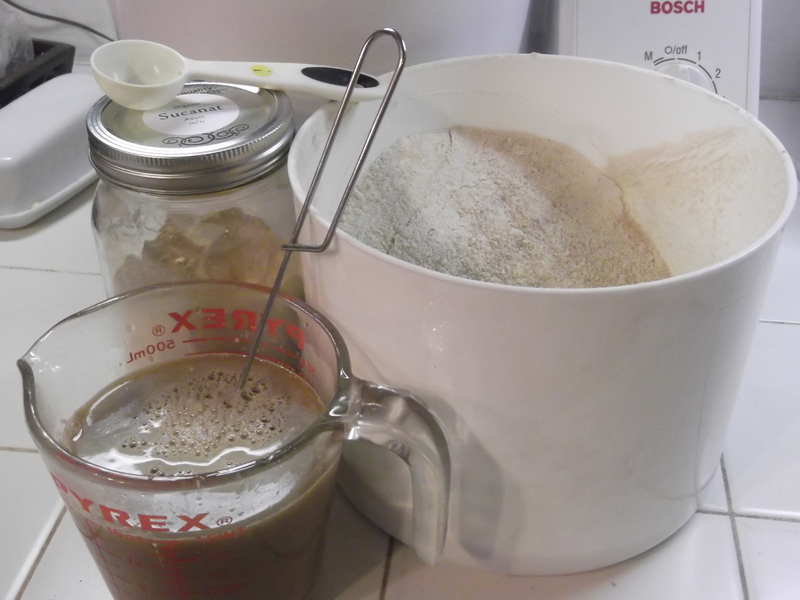 While the wheat’s grinding, I mix my yeast and sugar with warm water and let it get nice and bubbly. It now becomes a race between my ability to get the rest of the ingredients (except the flour) in the mixer and the yeast’s desire to bubble right over the top of the mixing cup. If the phone rings, I’m sunk. I suppose I could use a bigger measuring glass, but what’s the fun in that? 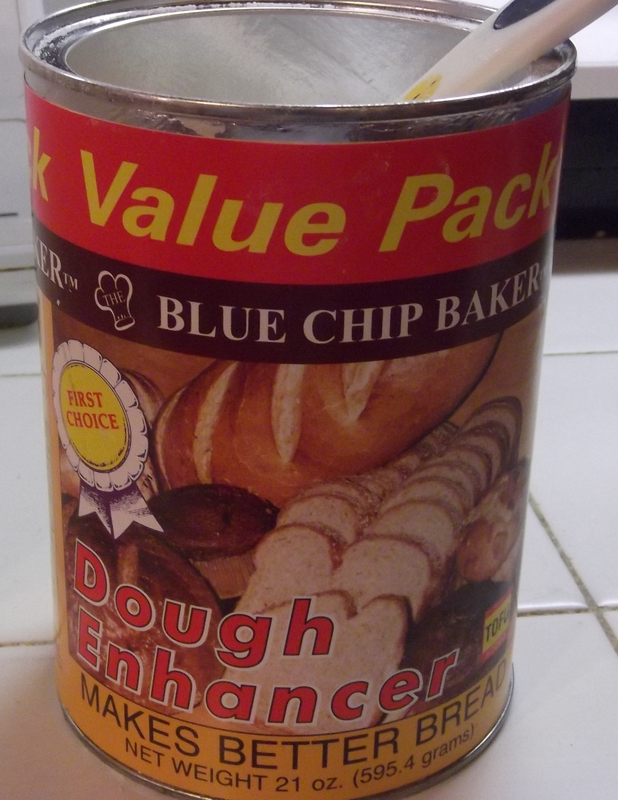 I use a dough enhancer – this helps my bread to rise better. There are a number of recipes for this online, or you can get it from a bread supplies retailer. 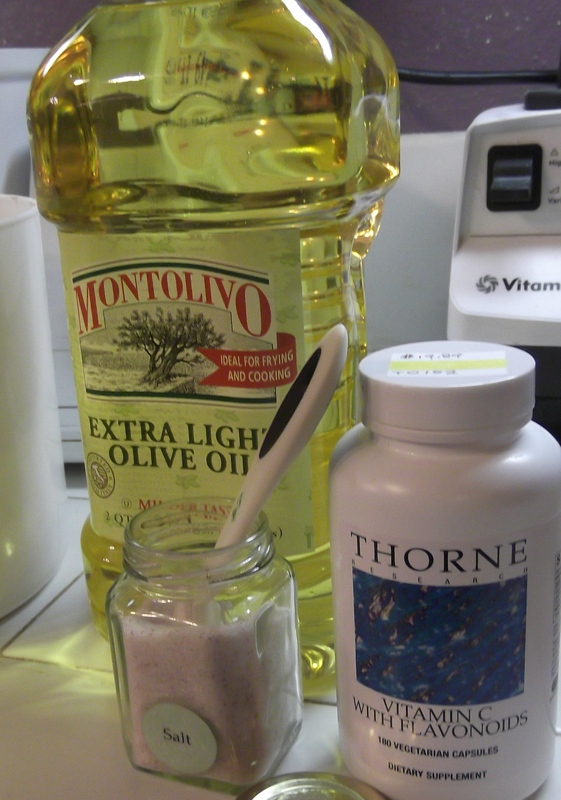 I also tend to measure anything over a tablespoon with a kitchen scale, rather than measuring cups. I add the yeast mixture to the rest of the ingredients. Next I begin adding the flour. I start with about 3 cups of flour, with the mixer on low, and then add flour about a half cup at a time. 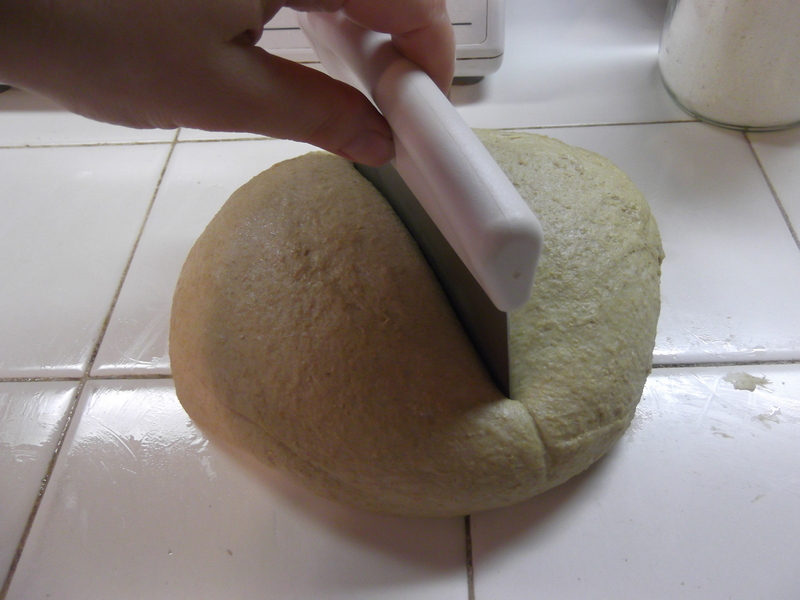 Once the dough begins cleaning the edge of the bowl, I turn it off, cover, and let it set for 20 minutes. There’s some French term for this soaking time; essentially I’m waiting for the water to fully saturate the bran of the wheat. 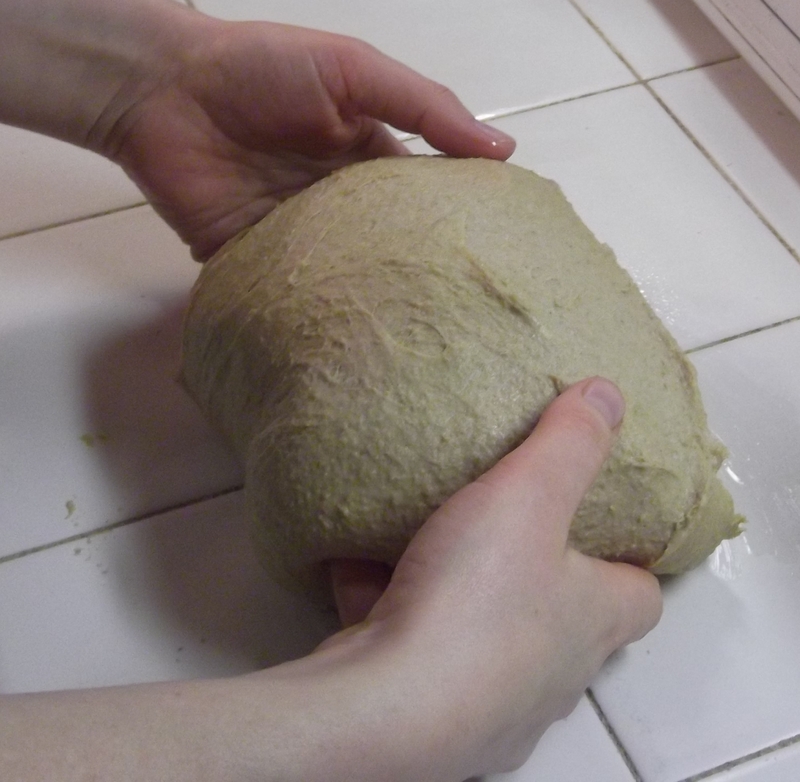 If I’ve been getting dense loaves, then I only add three-quarters of the flour in the recipe before I let it soak – this would be before the dough is cleaning the sides well. 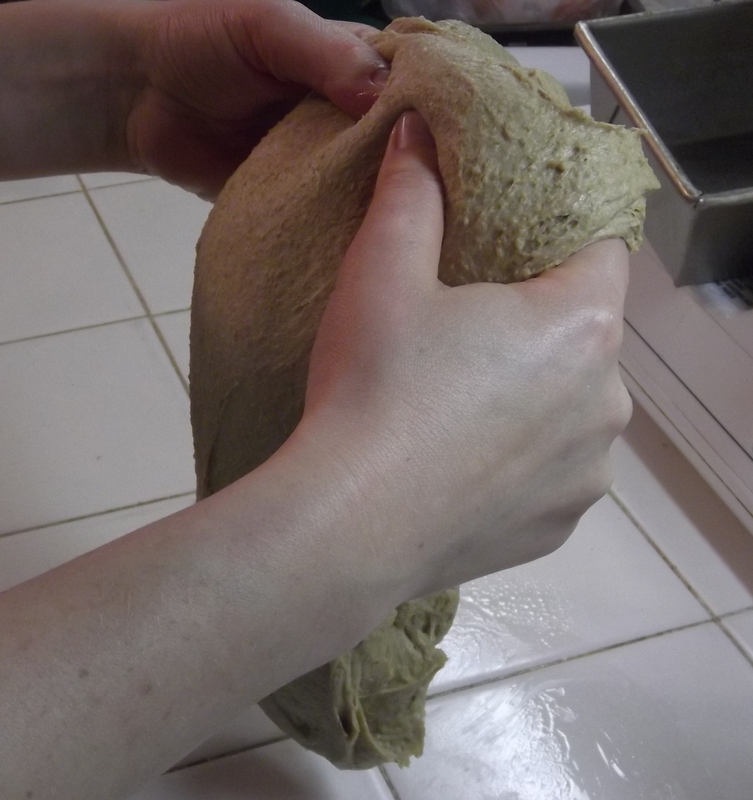 This makes higher hydration dough… that generally produces a tenderer loaf. 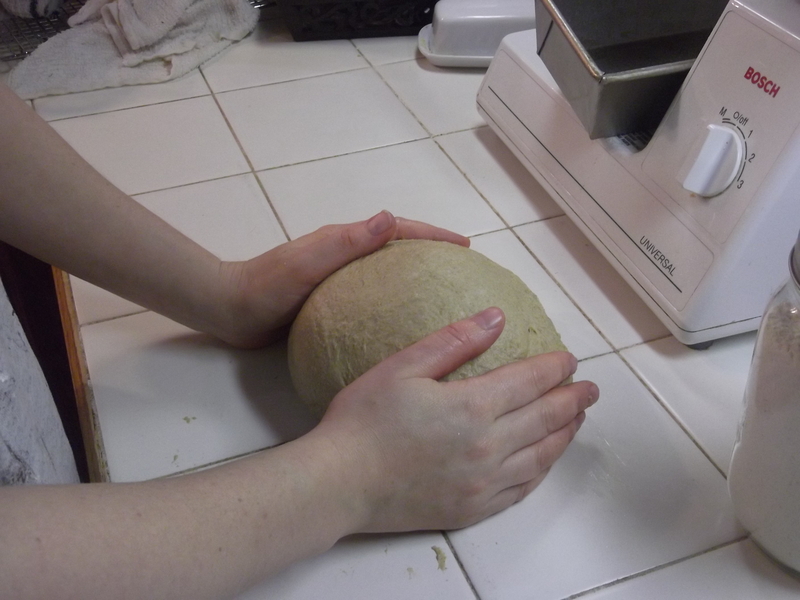 After the 20 minute rest, I knead the dough on low for 6 minutes. 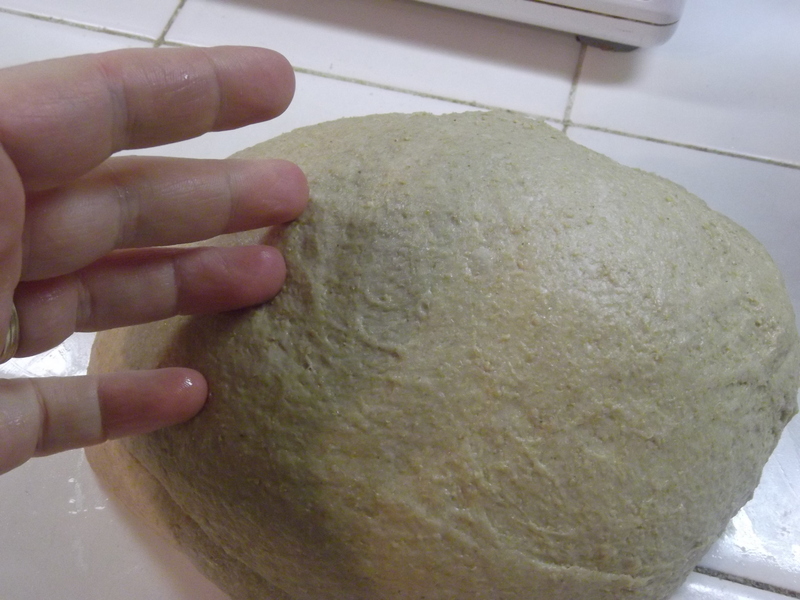 You can see how the dough is really coming together at this point. When the dough is turned out on the oiled counter, it’s still pretty sticky. I stretch and fold it over three times, rotating it 90° each time. Second stretch – it doesn’t show much of a difference yet. Third stretch: it’s lost its stickiness and is nice and smooth. Cut in half for two loaves. 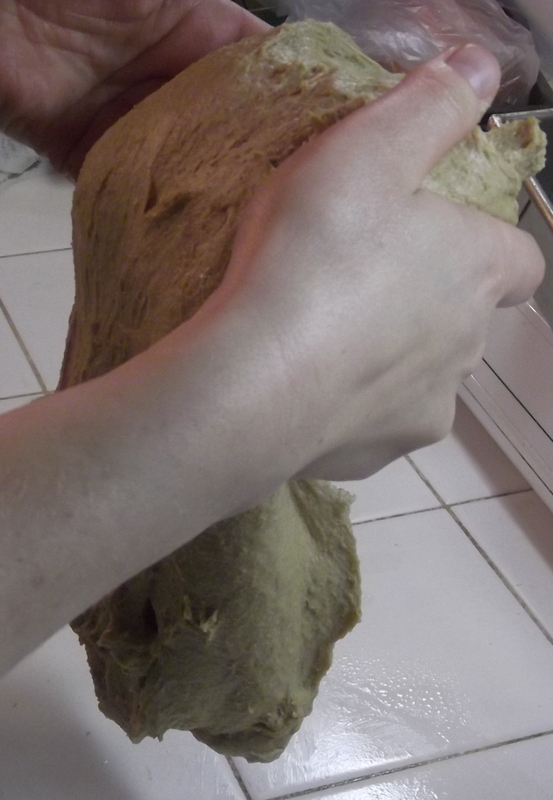 Pat into a rectangle roughly the same width as the loaf pan. Roll into a log, with the seam on the bottom. I create a proofing oven in my microwave with a cup of boiling water. This helps the bread rise better. Years ago when we lived in an apartment, the washer and dryer were in a closet in the kitchen. I had a rack meant for drying sneakers that fit inside the dryer. The idea was that you could set something on that shelf and run the dryer, and the stuff on the rack wouldn’t tumble. I used to run the dryer while I nuked the water, and put my boiling water into my warm dryer to create my proofing oven. 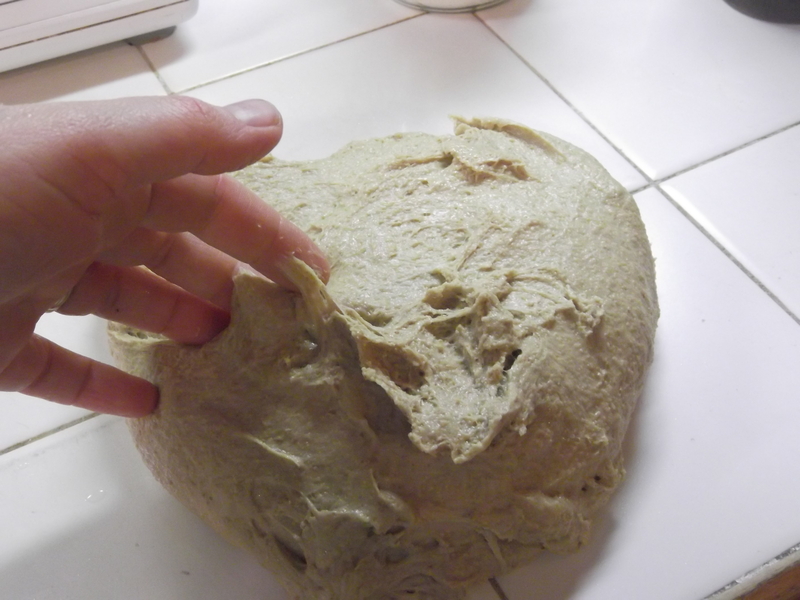 People were startled when I would announce suddenly that it was time that I took my dough out of the dryer! After about a half hour, preheat the oven to 350°. 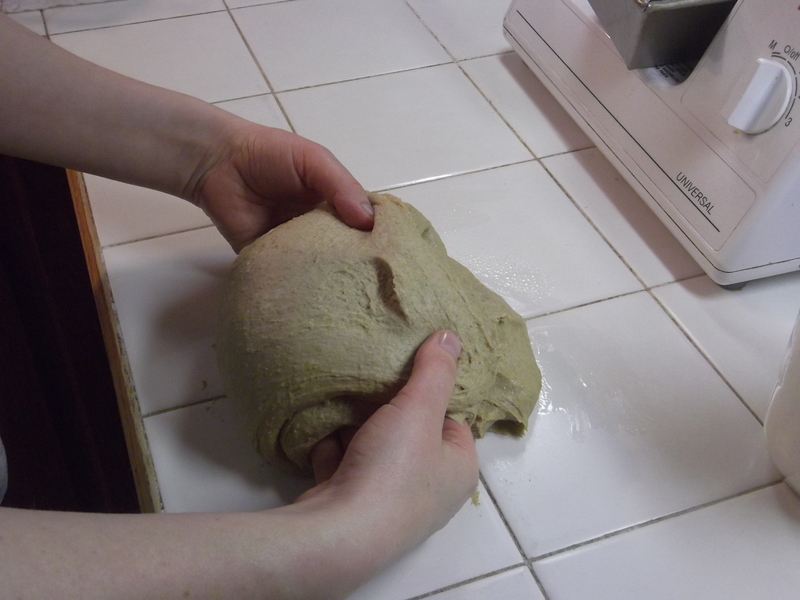 Once the oven’s preheated, the bread should be about ready to go in. It should have risen about an inch or so above the rim of the pan. Bake till it’s at least 198° internally, about 25-30 minutes. The only way I’ve found to keep bread from being gooey or collapsing in the middle is to get the internal temperature high enough that the inside is fully cooked. If it’s browning too much on the outside before the inside is baked, I tent it with foil for the remaining bake time. I’ve gone through a number of probe thermometers, and my Thermapen is the only one that’s lasted more than nine months. Cool on racks for ten minutes. Then remove from pans and allow to cool before storing it in plastic on the counter or in the freezer. Ta-da! Homemade bread, in just under two hours. 1 heaping T. (or 1 package) of yeast. Whisk yeast and sweetener into the water. Put all the rest of the ingredients except the flour into the mixer. Add half the flour, mix till combined. Turn mixer to low. 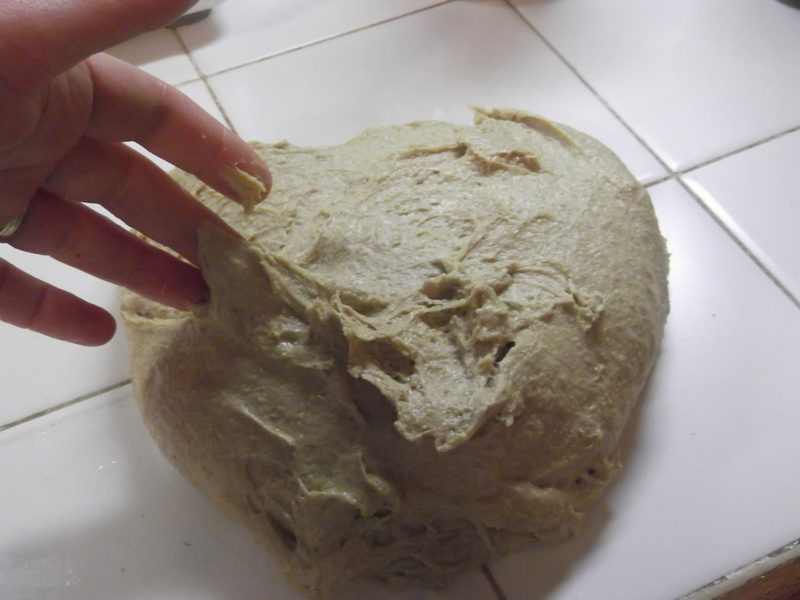 Begin adding flour in half cup quantities until dough is just beginning to clean the sides of the bowl. Cover and let set 20 minutes. 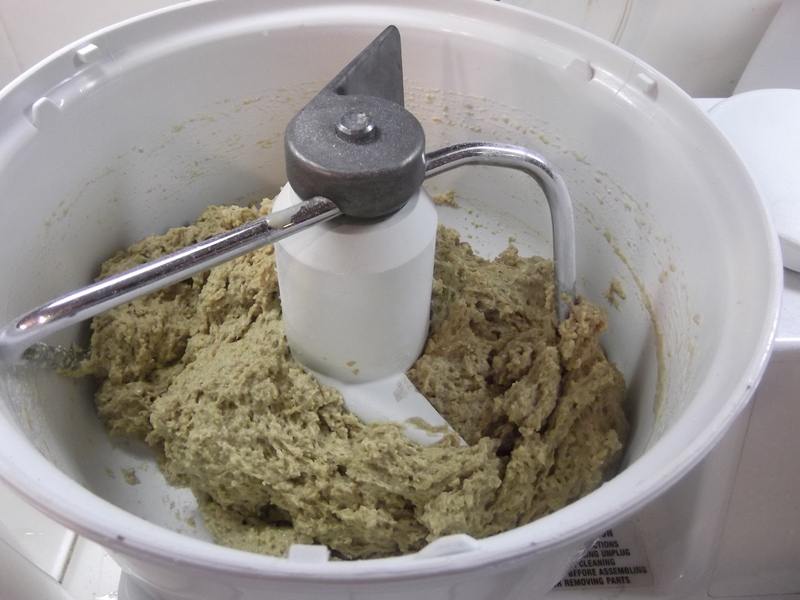 Turn mixer to low and let knead for 6 minutes. Place a cup of water in microwave and bring it to boil. Leave the door shut so that it gets nice and steamy in there. 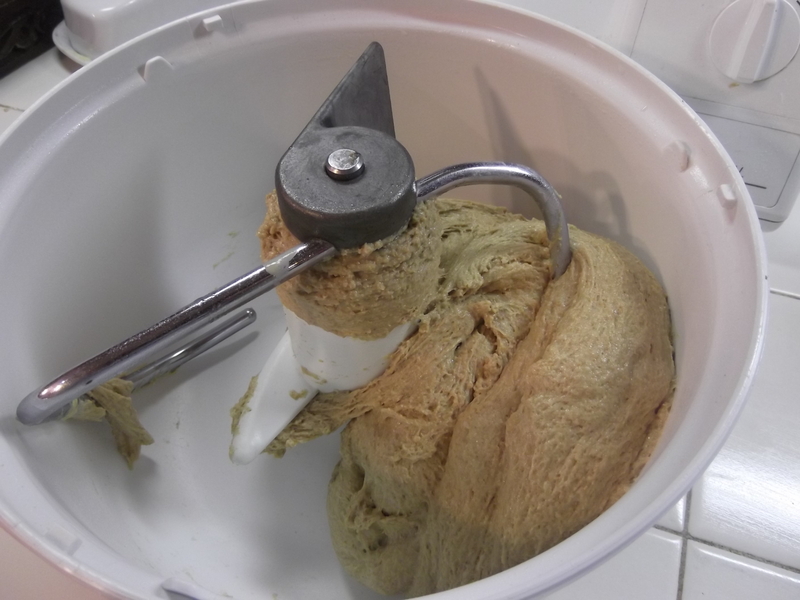 Oil counter and turn out dough. Stretch and rotate three times. 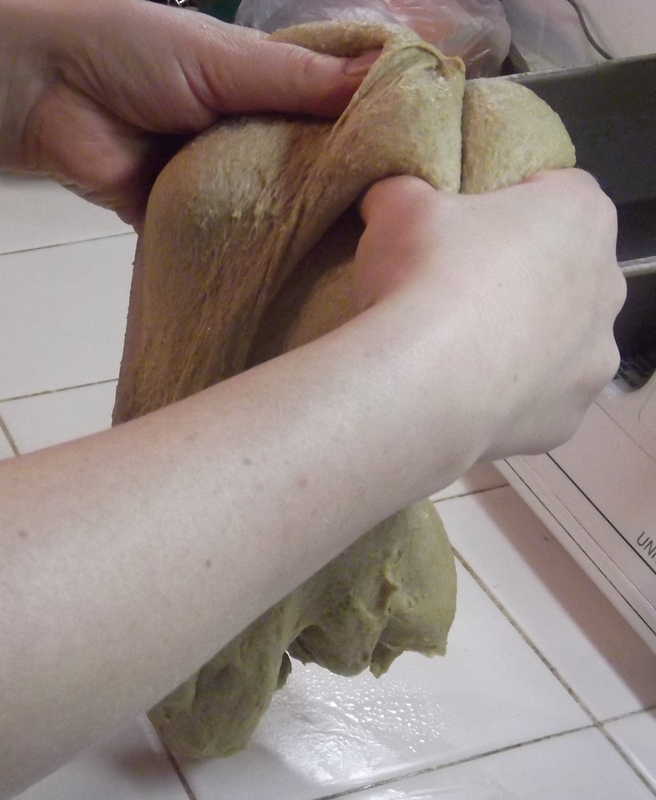 Cut dough in half for standard size loaves. 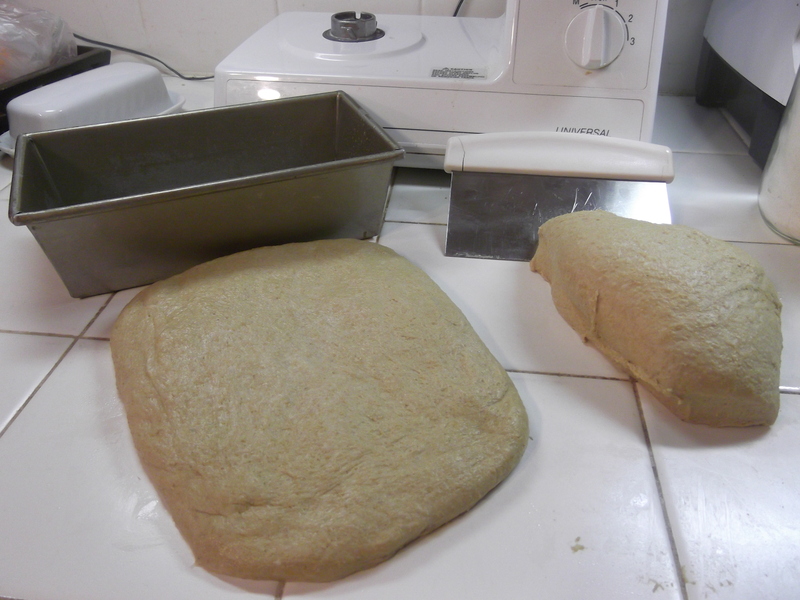 Pat each half into a rectangle roughly the width of the oiled bread pan. Roll into a log and place in pan, seam side down. 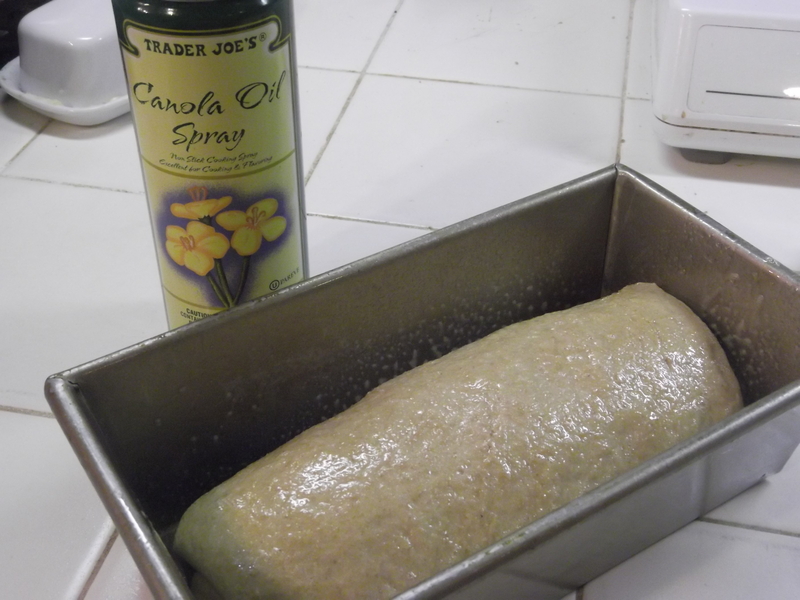 Spray loaves with oil and place in microwave. Set timer for 30 minutes. When time rings, preheat oven to 350°. Reset timer for 15 minutes to check bread. 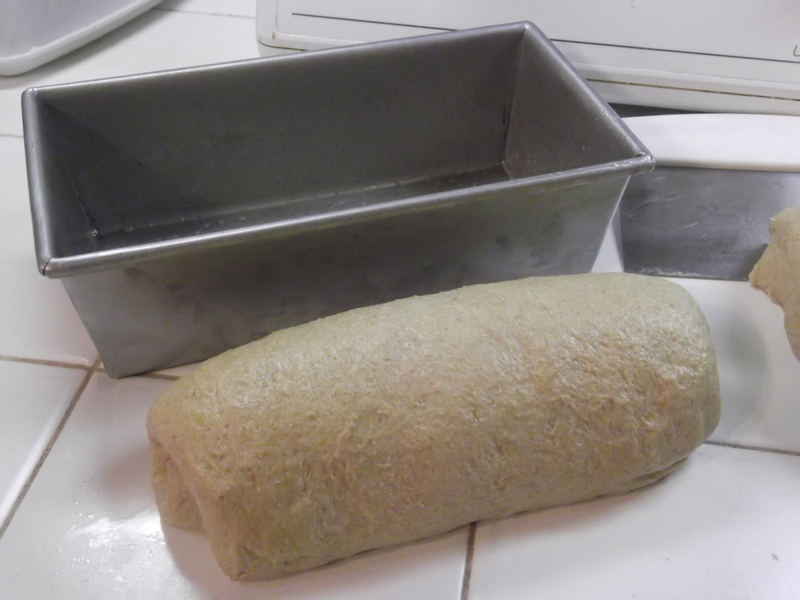 When loaves are about an inch above the edge of the pan, transfer to hot oven. 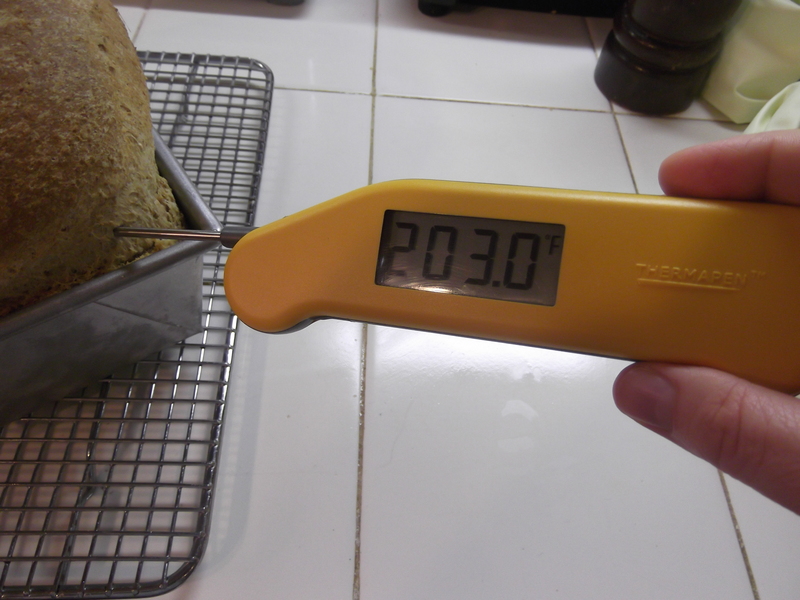 Bake 25-30 minutes, until interior of bread reaches at least 198°. Let loaves cool on rack for 10 minutes, then remove from pans. 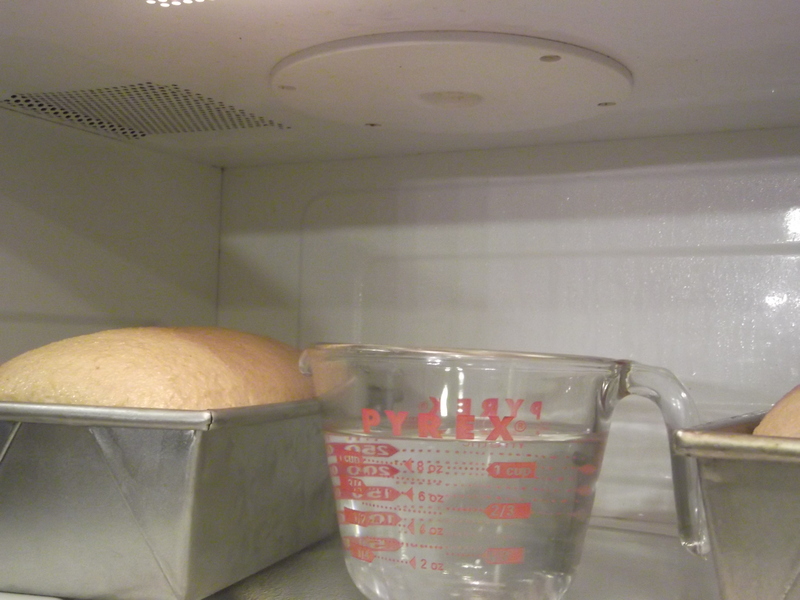 Allow to cool fully before putting in bread bags. 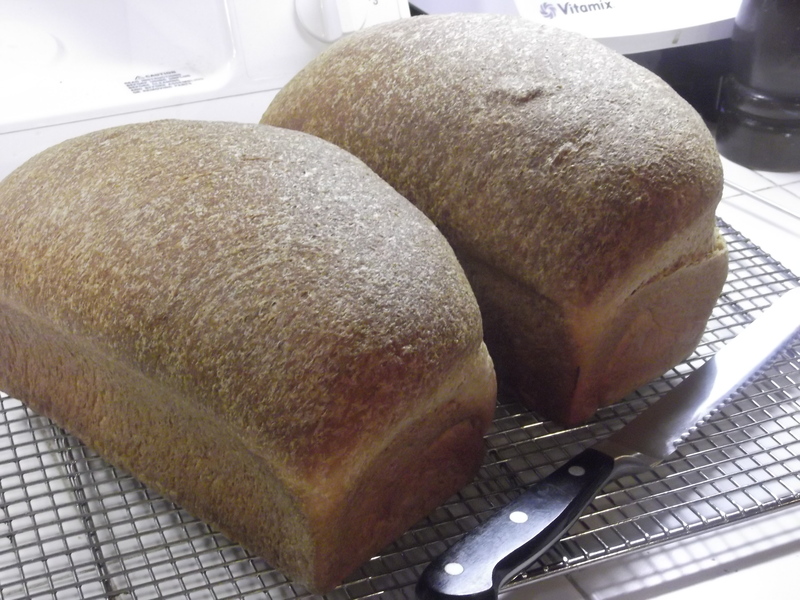 This entry was posted in Baking, Comfort Food and tagged baking, bread, Whole wheat bread. Bookmark the permalink.